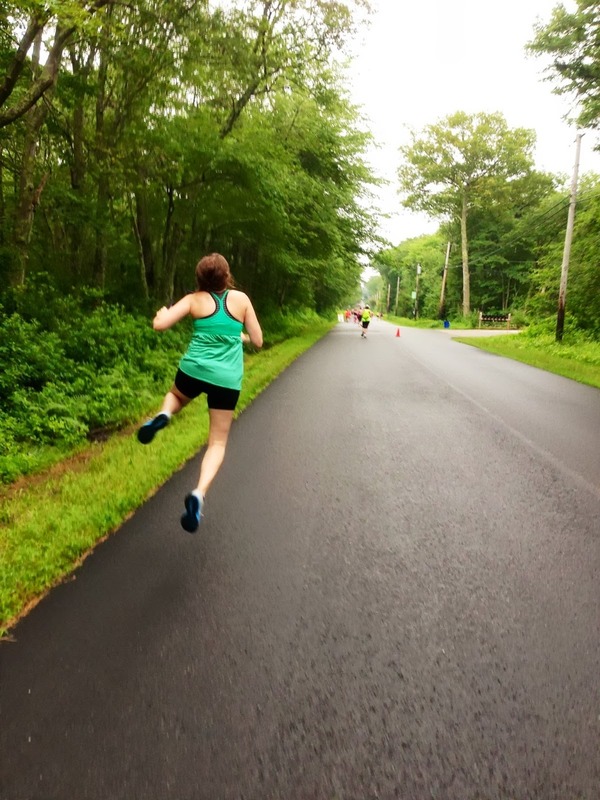 A couple months ago my friend Jessie told me about her plan to run a half marathon in every New England state this year - a pretty big challenge, considering she wasn't starting until June. 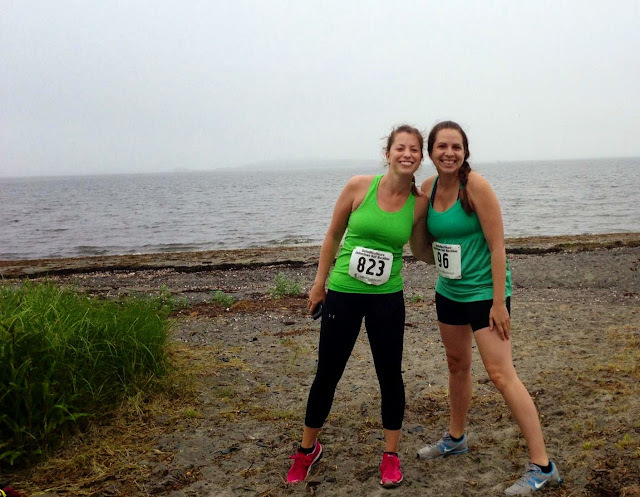 I ended up signing up for the Jamestown Half Marathon in Jamestown, Rhode Island with her...and then, as a result of insanely high temperatures and constant thunderstorms, I proceeded to not really train. But, hey, according to Jessie it was a scenic, flat race, and I had a done a half marathon before and had been running, just not long distances. Plus, I had started lifting in order to strengthen my supporting muscles and joints. How bad could it be? Are my eyes even open here? Considering it's 6am, probably not. Before I knew it, the race was upon us! I had a mild panic attack because I hadn't run more than 7 miles, so 2 days before the race I ran 8 miles in 90 degree weather. Not one of my finest ideas. On Friday, Christine and I drove down to Rhode Island to meet Jessie, who was coming from Boston. After 3.5 hours in the car we relaxed a bit at our swanky Motel 8 room and then went to packet pickup, which was about 40 minutes away in Newport. This is also where we would pick up the shuttle to the race. 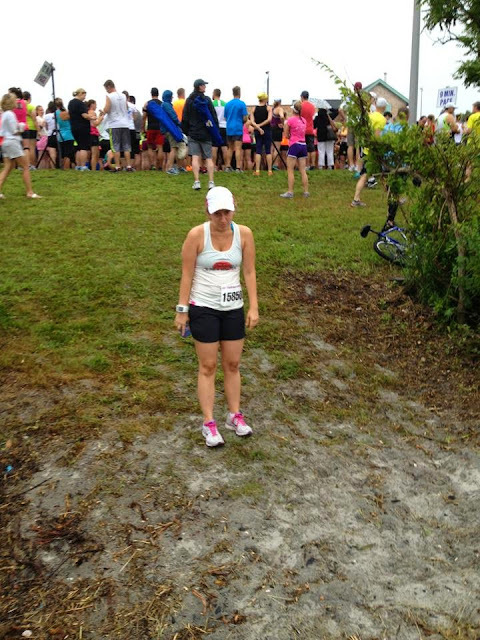 Christine, waiting for the race and reconsidering her decision to run. Unsurprisingly, because a shuttle was involved, the race started 25 minutes late - I really did not appreciate this, because there was a 6:30am start time and we had to drive 40 minutes to the shuttle. Since we're responsible individuals, we accounted for all this travel time and arrived at the start with a good 20-30 minutes to spare. The last thing I want to do when getting up at 4am is wait around an extra 30 minutes for people who decided to sleep in, not to mention I'm burning through a lot of my adrenaline during this wait. Unfortunately, there was nothing we could do about it, and we spent the time waiting taking pre-race photos and talking about going to the bathroom, as runners do. 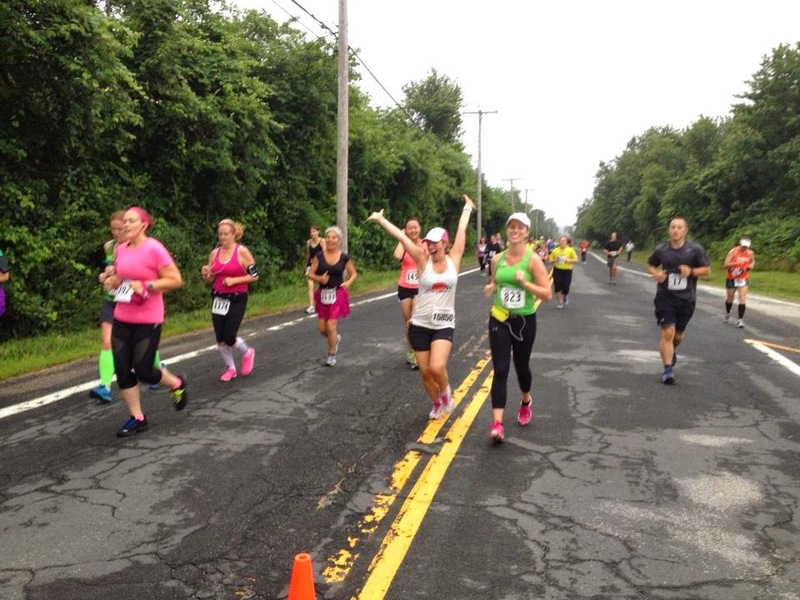 Jessie practicing her heel click for crossing the finish line. Sadly, it didn't happen, as she was afraid of kicking the person behind her. Once the race finally started, we had a pretty good time. It was not scenic and flat. It was hilly. Like, all hills. Very pretty though, and we ran a lot through the countryside and past many beautiful homes and a cute little town. I was concerned my knee was going to prevent me from finishing, since it started aching within the first 100 yards. Needless to say, I made it. 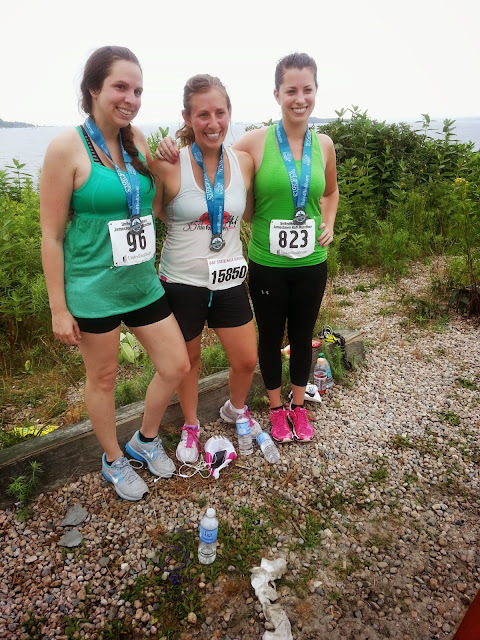 We had coerced Christine into running with us (originally she was just going to cheer us on) and we stayed together for the first 6 to 7 miles and then decided to split up. This was a bit humorous because we ended up finishing within 1-2 minutes of each other! Needless to say, I'd call my 2nd half marathon a success. I hope that I can get my knees in line with the rest of my body because at the moment, my stamina and muscle strength far surpass the limitations of my joints. I ended up finishing the race with a 2:28:46 time and 11:21 average pace. Shattered knees aside, I felt great, and I know I picked up my pace a lot between miles 9-13, because we had previously been running an 11:46 min/mile pace up until at least mile 7. I wouldn't be surprised if my final miles were well under 11 minutes. 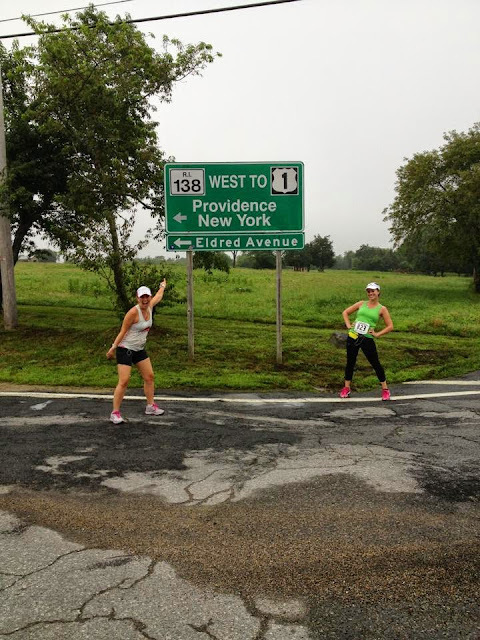 2nd Half Marathon, 2nd State! It is really great to have friends to run with. Most of us don't live in the same city, or really even the same state, but it is really fun to plan races together, kind of like a mini vacation. Sometimes it's the only way we see one another! 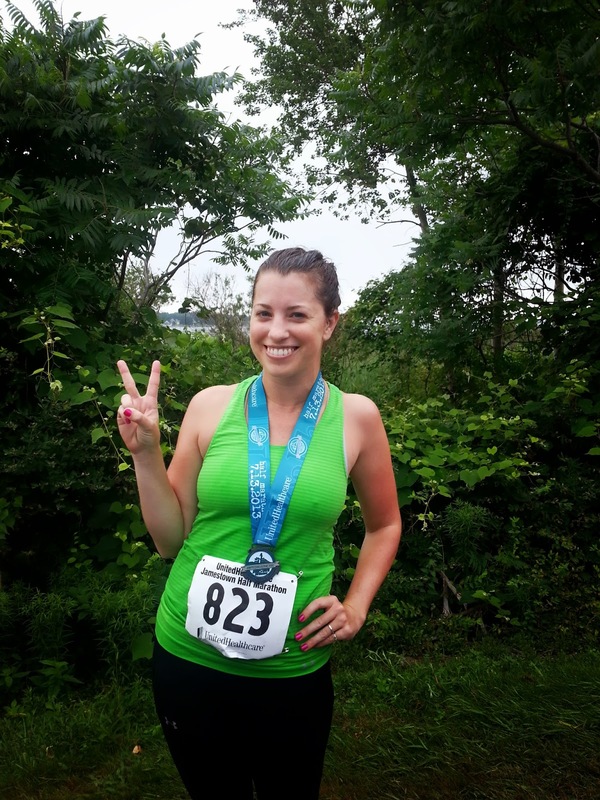 I did the same thing for the Nike Women's Half Marathon in DC (which I need to post about!) and next year there is a group of us (6 and counting!) running the Disney Princess Half Marathon in February, which is 2 days after my 30th birthday (and also on Tony's and My's 3rd anniversary :P). p.s. many of the pics I stole from Christine, I just didn't have the energy to fool around with my camera this race. Congratulations on your run, that's amazing... Thanks for stopping by my blog and for your nice comments .